Mobile apps have evolved into one of the best ways for people around the world to interact with one another and to entertain themselves. However not all smartphone apps see the same level of popularity on a global scale. Different cultures and different countries use technology in different ways. 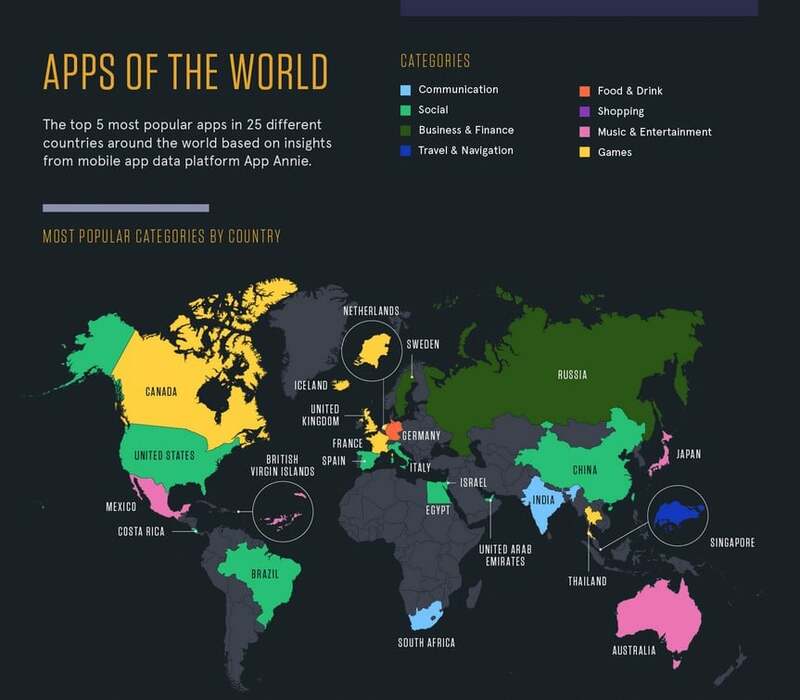 To try and gain insight into how people are using mobile apps around the world, Marketing Resources recently analyzed data from the mobile app data platform App Annie to figure out the top 5 mobile apps in 25 different countries around the world. Their goal was to identify the top app categories in each country as well as the most popular apps in each country. Their analysis showed some interesting trends. The most notable was that social media apps seemed to dominate worldwide. Of the 25 countries analyzed, social media apps held the top spot in a third of those countries. Topping the list was the United States that had 3 social media apps in their top 5 most popular mobile apps. Another interesting regional trend is that gaming apps, entertainment and music seemed to dominate especially in European countries. South Africans liked to stay connect with others as they had 3 different communication apps in their top 5 (WhatsApp, Truecaller, and Messenger. 11 other countries also had a communication app as their most popular choice. Listed below is the top category and top app for each country that was analyzed in the report from Marketing Resources. To see the full report and analysis, check out the graphic below.